Youth football drills - this drill is called Doctor Doctor! Youth Football Drills - Doctor Doctor Game! 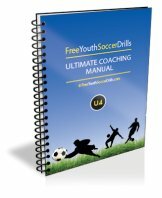 Youth football drills such as this one are kids favourites as they involve a fun competitive edge whilst also coaching the necessary skills. Take a look at the diagram below. You will need a marked out area larger area with two smaller areas for the 'doctors houses'. The players need to be split into 2 teams and everyone except two players will need a ball each. Two teams battle it out to win this game of doctor doctor. Each team will need a doctor who will start in their smaller area (doctor house) without a ball. All the other players start somewhere inside the larger area with a ball each at their feet. Youth football drills like this one are fun but it is important to coach the necessary points at all time. The object of the game is to try and kick the other teams balls outside of the area and retain yours. If a players ball is kicked out of the area they must leave it and go to ground shouting 'doctor, doctor help!' This player can only retrieve their ball and stand up and carry on once their teams doctor has tagged them. To win the game, a team must pass/kick their ball at the other teams doctor once they come out to tag their team mates who have had their ball kicked out.This game may sound complicated but it really isn't. The doctors cannot be shot at if they are in their doctor houses. This will encourage the players with balls to attempt to tackle the other players and kick their balls out of the area. The players who are kicking the ball at the doctor must aim for a pass to hit below the knee.Youth football drills like this one need explaining and demonstrating step-by-step until the players understand what they must do. It is also okay to stop the game half way through to show a coaching point. There are many coaching points that should be coached in this game. It is important to change the doctor after every game to allow each player to have a go with the ball at their feet. Give a team a point for skilful or clever play such as doing a turn or a trick or changing direction well with the ball at their feet. -> Demonstrate clearly the ABC of passing and get one of the players to show everyone else how the doctor could be hit.